Check-out until 12.00 a.m. noon! There is no reception in the buildings, we are not available all the time at the apartments, so please give us a call 60 minutes prior to your arrival at +362033502 33 so that we could let you in. Please, indicate your expected time of arrival as well. The rate of deposit is 50% of the price of the accommodation concerned. Payment can be made by bank transfer or credit card. You are going to be informed about the required payment details (bank account number, your credit card details, etc.) during the booking process. In case no deposit is received within 4 banking days after the confirmation of your booking, a reminder will be sent to you. If the deposit fails two arrive after this, your reservation will be cancelled. Name of bank: CIB Bank Zrt. Please enter the name of guest indicated in the booking in the reference box! The card information will get into our system via an encrypted channel, whereby payment is completely safe, and no third party can get access to any information concerned. Monday-Friday 8 a.m.-7 p.m. | On Saturday 7 a.m.-1 p.m.
Monday-Friday 8 a.m.-5 p.m. | Saturday and Sunday are FREE! On foot 5 minutes from the apartments. If booking is cancelled or modified not later than 14 days before arrival up to 4 p.m. of the day concerned, the deposit will be refunded. If the booking is cancelled or modified later than that or in case of no-show, we cannot refund the deposit (50% of the accommodation fee). Your booking can be modified without penalty (penalty = the amount of the deposit) no later than 14 days prior to arrival. A new confirmation will be sent to you about the modified booking, while the original reservation will become void. 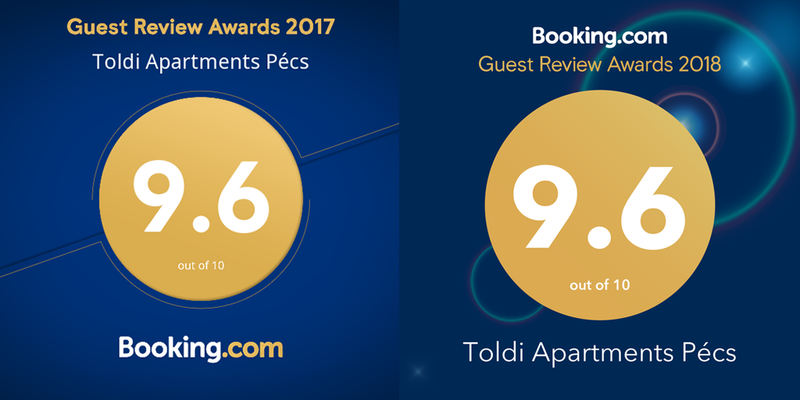 Toldi Apartments Pécs reserves the right to provide you with an alternative apartment of their own of the same category of your booking. We will inform you and consult with you about any possible changes initiated by us. The accommodations can be used by the number of guests specified at booking. Accommodation fee includes the overheads (water, electricity, heating, use of air conditioning in summer, bed linen, towels, access to unlimited wireless Internet). You are not required to pay any extra costs in addition to the accommodation fee confirmed. NO final cleaning fee is charged. The accommodations are free for children under the age of 2. Plastic cutlery, glasses, plates are also available in our apartments. We can also provide a portable cot (without mattress and bedding) and high chairs on request. Please make sure to send your request to that effect in advance. Thank You!